Don't be surprised to see a lot of Canadians with sore thumbs. According to the Canadian Wireless Telecommunications Association, Canadians sent out 2500 text messages each second for a total of 78 billion SMS messages in 2011. That was up a pretty big 40% from the 56.4 billion texts sent in 2010. The number of MMS messages sent by Canadians last year, which includes pictures and video, tallied 326.7 million. Other figures released by the CWTA include the number of short code text messages sent. These are messages used for commercial purposes or for charity. 2.8 billion of those messages were sent in 2011 in Canada. 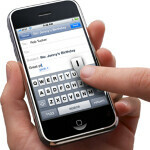 The number of personal text messages sent up north in Canada has quadrupled since 2008. While that sounds like a huge increase, since 2006 that figure has risen by 20 times. Seriously? Multiple things at once? Driving would be the first choice, right? I use my phone about three times a day for less than five minutes and I get more done. And I make a little over $100,000 a year, dude. I doubt I'd make more by texting all day. Can I marry you or be you f**king pet????? I won't be evil. I can change my ways. Didn't ask how much you made. And I wasn't even thinking of driving either. I meant you can do more if you are short of time. You can listen to music while walking down the street and have privacy when texting. Try going all three. Texting might take longer but it is more convenient. With apps like Whatsapp, i think the SMS's will go down and it's a reason to worry about loss of revenue for the carriers. It's almost data now for everything. Not sure if these numbers will continue to rise or to say even stay at this position. hmmm.